Val is BRAIN’s newest staff writer. She comes to the magazine with a varied background including stints as a bike shop manager, bicycle tour guide, and race and event director. She also worked as a freelance writer in the outdoor and travel industries. Most recently, she taught women’s clinics and drove a demo van, working with Giant retailers all over the west. An Idaho native who has lived all over the northwest, Val is excited about her recent relocation to sunny southern California, where she can mountain bike, trail run, and garden year round. She lives in Silverado canyon with her boyfriend Brian and their two dogs. DAYTON, Ohio (BRAIN) — In its 126-year history, Huffy Bicycles has proved time and again that the ability to adapt is embedded in its DNA. From world wars and the slow death of American manufacturing to the rise of mass retailing and the current retail apocalypse, the company, which got its start when founder George Huffman purchased manufacturer Davis Sewing Machine in 1891, has endured just about every market disruption of the modern era. Mass brand makes major investments amid market disruption — and wants to bring the IBD along for the ride. DAYTON, Ohio (BRAIN) — Allite Inc., a new materials sciences company that manufactures metal alloys, has announced that its proprietary Super Magnesium alloy is now available to the cycling industry. Allite's parent, UWHK Ltd., also owns Huffy Bicycles and recently built a factory in China to manufacture the alloys, which are said to be light, recyclable and less expensive than carbon. 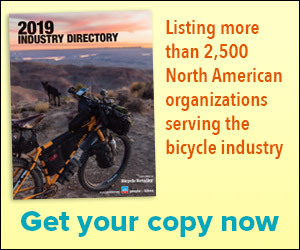 PARK CITY, Utah (BRAIN) — Park City Bike Demos, a retailer offering rental and paid-demo bicycles that are available for sale, is selling the business's assets for $120,000. The money will be used to pay the company's debtors. REDDING, Calif. (BRAIN) — More than a dozen large wildfires continue to burn in California, with several thousands acres destroyed as the state also endured the hottest July on record. PORTLAND, Ore. (BRAIN) — Longtime mechanic Kevin Purcell and his wife Becky Newman recently opened Golden Pliers Bicycle Repair & Supply in North Portland. WEST COVINA, Calif. (BRAIN) — Foldaway Solutions, which distributes Oyama Bicycles, Uniche and BTP Bar Tape, is working with BionX Canada's battery supplier to provide replacement batteries for its e-bike conversion kits following the company's bankruptcy and resulting sale of some of its assets earlier in June. AURORA, Ontario (BRAIN) — Three companies have purchased parts of BionX Canada following a three-month search for a buyer. COLORADO SPRINGS, Colo. (BRAIN) — Retailer Bruce McGrew recently opened a second Pro Cycling store on Colorado Springs' east side. Located in a high-traffic retail development, the new store serves a growing part of the city, which is home to about 450,000 residents. The shop opened its doors mid-June. IRVINE, Calif. (BRAIN) — After serving Orange County cyclists for more than a decade, ARB Cyclery’s last day of business was May 31. AUSTIN, Tex. (BRAIN) — Endurance House locations in Jacksonville, Florida, and Laguna Niguel, California, have recently closed. The two stores were independently owned and operated franchises, each with an average four to six employees and around 3,000 square feet in size.